The Big Book O’ Photo Prompts has “yellow” as my new photo challenge. Of all the colors in the spectrum, yellow is my least favorite; looking through photos, I realized I even shy away from things that are yellow out in the world. I can’t explain it. It just is. Nevertheless, challenge accepted. I have kind of a thing for rubber duckies. It started when I got one as part of a Secret Santa gift at an old job, and it’s grown. Slowly and incrementally, but it’s grown, and I’ve recently had to rearrange my duck shelf to make additional room. It’s not an unhealthy obsession, I don’t have them crammed onto every available surface and I most certainly do NOT want rubber ducky bath accessories. Shower curtains, bath mats. Thank you, but no. However, travel tchotchke rubber duckies? I’m on that. Behold the newest addition to our rubber duck family! Meet Septimus, seventh duck on our shelf. We found Septimus in the gift shop at the Roman Baths in (of course) Bath, England, and it was no-brainer as to whether or not he’d be joining the flock. Clearly, Septimus is a Roman Centurion; notice the transverse crest on his helmet. 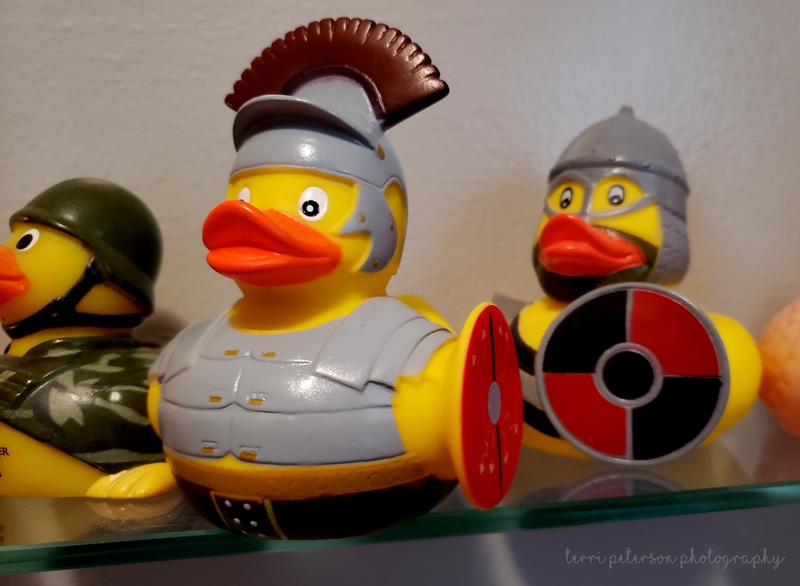 There is a part of me that wants to stage elaborate battles between Septimus and the Viking duck behind him (named Ragnar Lothduck, because ~~~duh~~~). And then there is a part of me that wants to know why my duckies tend to have a military bent.